It can be tempting to do your own home repairs, especially if it seems like a quick and easy job, or if you don’t want to pay for a professional tradesman. Yet DIY home repairs can actually become quite costly if you accidentally damage your health or your home in the process. There is also a chance that you might make your house a hazardous zone for your entire family if you accidentally expose fumes or toxic materials, disturb rodents or other pests, cause structural damage, or connect wiring in an incorrect way. But while there are some projects that should only be tackled by a professional tradesman, it is possible to undertake DIY home maintenance without risking your property or your health, provided that you choose your projects properly, and that you prepare yourself in advance. Your plumbing is intended to deliver clean fresh water into your home and drain away sewage. It took thousands of years for mankind to refine this system so that we can enjoy the benefits of running water in the home. Needless to say, the plumbing system is fairly intricate, and sometimes carries the added risk of combining water with electricity. It’s important that all the pipes are connected, unblocked and uncracked for this system to work efficiently and safely. With DIY electrical and plumbing work, it’s more about what you can’t do than what you can. Novice plumbers struggle to use the correct equipment, and may also mix up pipes so that drinking water becomes contaminated. Installing the pipes incorrectly can lead to leaks or blockages, and even digging trenches for pipes can be hazardous if you accidentally damage telecommunication wiring, underground electricity cables, or gas pipes. Water seepage can trigger the growth of mould and other harmful bacteria, while untreated sewer issues could cause polluted water to flow back into your house through the plumbing. A DIY plumbing job could also sabotage the workings of your thermostat, making your tap water run either stone cold, or hot enough to scald your skin. Your gas appliances must be fitted and maintained by licensed professional gas fitter. If your appliance is fitted wrongly or has inadequate ventilation, this could cause a serious health hazard. You’ll also need an expert to verify whether the location you have chosen is suitable for the appliance. A gas appliance needs a certain amount of natural ventilation for complete combustion, or it will produce carbon monoxide (a deadly gas with no odor). Many outdoor appliances need more ventilation than indoor appliances, so as to prevent a build-up of toxic gases. If you want to make structural changes to your home, such as knocking down walls or constructing new rooms, you need to delegate to an expert. Demolishing walls can release toxic materials such as asbestos fibres, and major structural changes can affect the overall stability and safety of your home. You may even find yourself injured from falling materials or from exposed electrical wires. Another unexpected problem with structural changes is that you might disturb pests such as rodents or spiders, which can lead to animal-related injuries. It is illegal to perform unlicensed electrical work, even in your own home. 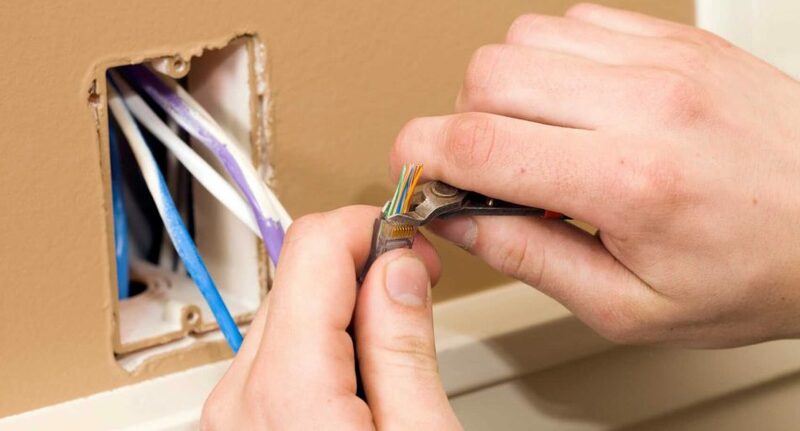 A simple error, such as using the wrong electrical wire, the wrong fuse size, or confusing the neutral wire with the ground wire, could cause a short circuit or create an electrical fire hazard. Worse still, you could be electrocuted on the job. You might be lucky and suffer a minor jolt, but a high voltage shock can lead to deep burns and internal injury, or simply kill you.. If your electrical work starts a fire, you could be facing financial loss, not to mention endangering the lives of your family and neighbours. When your roof leaks, the water may continue accumulating and travelling downwards through every crevice and porous surface in your house, eventually causing major damage. While you might be impatient to fix the problem, you could cause more damage to the roof if you don’t know exactly what you are doing. ossums and snakes are common roof-dwellers in Australian roofs, and they can give you a fright when you are perched precariously on a ladder or reaching into the roof cavity. You best option is to hire a professional. Of course, you don’t need to hire a professional for simple home repair and maintenance jobs. But even the simplest home repair job can be risky. You can minimize the potential hazards by following these five simple rules throughout the entire DIY project. Before you start, you’ll need to figure out exactly what you plan to do, what materials you need to tackle the job, and how much time will be required to complete the project satisfactorily. There are some good demonstration videos available on the internet, which can show you how to approach the job, and even how to set up your equipment before you start. You could also ask other DIY experts—your friends or the assistants at your local hardware store—for their advice and input. While it’s always enlightening to learn from your own mistakes, it’s even better to learn from someone else’s mistakes before you start! It might seem cheaper and quicker to buy the latest roofing materials from the local hardware store, but if this material is poor quality, it will not prevent your roof from leaking. Whatever job you are undertaking, you need the right equipment or tools, and you don’t want to be halfway through the job and realize you needed sandpaper or a different sized screw drivers Make a detailed list of everything you need, and check your list twice before starting the job. If you haven’t done much DIY home maintenance, know that the hardware store can be confusing when choosing between different brands and options. Ask for help if necessary to ensure that you purchase the best quality and most effective materials for your task. A professional tradesman has access to the best quality materials available at wholesale prices and also has the experience to assess exactly what to use to complete your job efficiently. You probably do not have the resources or the expertise to make these decisions as effectively. It might seem cheaper and quicker to buy the latest roofing materials from the local hardware store, but if this material is poor quality, it will not prevent your roof from leaking. If you are planning to use power tools, inspect your tools and replace any parts that are worn or damaged, and check specifically to see whether the cords are frayed. Another important element of preparation is to clear the work area and to check that you have all the necessary materials within arm’s reach. Keep a copy of your instructions at hand if you feel you will need to check any details. One of the major issues in most DIY projects is the dispersion of dust, which can be an irritant or even toxic, so it is important to limit the movement of dust from beyond the work area as much as possible. When working outside, lay plastic sheeting under your work area to create a barrier so that the dust doesn’t contaminate the ground. Close all the windows and doors of your home to prevent dust entering the house. If you are working inside, seal off the work area from the rest of the house to prevent contamination. Cover your air conditioning vents and ducts to prevent dust from accumulating and then circulating through the house. Many DIY products such as paints or glues are “volatile organic compounds” or VOCs, which means that they may be toxic in high concentrations. While the VOC level in most DIY materials is strictly regulated, it is still important to allow plenty of ventilation in your work area to prevent a concentration of fumes. Put down drop sheets or newspaper to keep the area clean, and remove any valuables that might accidentally be knocked into or otherwise damaged. Arrange for someone else to take responsibility for children while you are working so that they don’t inadvertently disrupt the project, and if the phone rings, ignore it until you are finished. Finally, make sure you set aside a realistic length of time to complete the project. If you are rushed, you will be tempted to cut corners, and that will only end up costing you more time and effort later. The primary cause of DIY fatalities is falling from a ladder, followed by being hit or crushed by falling material (such as bricks), and the third most common cause of DIY related death is electrocution. For every death, there are countless injuries that are far less severe, many of which go unreported, yet virtually all of these accidents are preventable with some forward thinking and common sense safety practices. The most common minor injuries relate to hammers and nails, and can range from trivial (hitting your thumb with the hammer) to potentially serious (a deep scratch from a rusty nail). Thorough preventative measures can minimise the risk of DIY injuries. Start by protecting your body from injury by wearing safety gloves, goggles, a dust mask, and covered shoes. Gloves and goggles are important even if you are working in the garden, as insects or spiders will be compelled to bite if they are disturbed, and twigs or dirt could fly into your eye causing damage. Make sure you have a firm balance at all times, whether you are working at ground level or higher. You don’t want to fall, and you don’t want to be in a position where something can fall on you. If you are working above floor level, for example on a ladder, make sure your position is stable, and that you don’t have to balance awkwardly to get the job done. Keep all tools on a flat stable surface positioned so you don’t have to reach precariously for them. Maintain control over your power tools. Always use a ground fault circuit interrupter (GFCI) and always turn the switch to OFF before plugging or unplugging the tool, as a sudden start-up after a voltage drop can cause the tool to “jump” which can lead to lethal injury within seconds. Also remove all jewellery, including rings, before operating a power tool, and avoid wearing loose clothing. Most power tool accidents are caused by using the wrong tool for the job, so check that your chosen tool is suitable for this particular project. Failure to wear safety gear is another major factor in power tool related accidents, yet can often been prevented with the use of safety goggles. Think ahead to minimise your exposure to dust and fumes. For example, use minimal force to dislodge demolition material, so you can safely lift pieces away rather than dealing with excessive dust. Don’t eat drink or smoke while you are working, as you could inhale or eat any dust in the air. At the end of each work session and at the end of each day, you’ll have to clean your work area thoroughly. If there is a great deal of dust, you’ll need to take precautions so this does not spread beyond the work area. Wrap waste material in plastic and tape before removing it from the work area, and dispose of the waste in an approved waste facility. Lead or asbestos waste must be clearly labelled. Rather than sweeping the area, which will stir up dust, dampen the dust with a mist of water. Wash plastic sheeting thoroughly and tip wastewater not containing VOC waste into the sewer rather than stormwater drains or onto the ground. Wash your work clothes separately from your family’s clothes, and rinse out the washing machine when they are done. If you are determined to conduct your own DIY projects, you must take the appropriate precautions to avoid damage to your home and physical injury to yourself. Almost all DIY injuries are completely avoidable with a little forethought and planning. However, it is also important to know your own limits. Just because a project looked simple on a YouTube video or a home renovation program doesn’t mean you can achieve the same results at home. You don’t know all the planning and preparation—or even the film editing—involved in making a fifteen-minute segment on home maintenance. Often these videos are intended as showpieces to tempt ambitious DIYers to purchase certain tools and materials. If you are inexperienced in using certain tools, then taking on an ambitious home renovation project could be disastrous for your home and for your own safety. If you want to become more proficient in DIY projects, take it slowly and establish safe practices as you learn to use tools through uncomplicated projects. When something must be done immediately, call the professionals. You might think they are expensive and inconvenient, but they will get the repairs done without putting your family at risk. If you are looking for home & contents insurance, be sure to find the right home cover for your situation. And get a quote with Budget Direct. If you found this interesting, read our article called 5 Tips To Improve Your Home Security Outdoors.